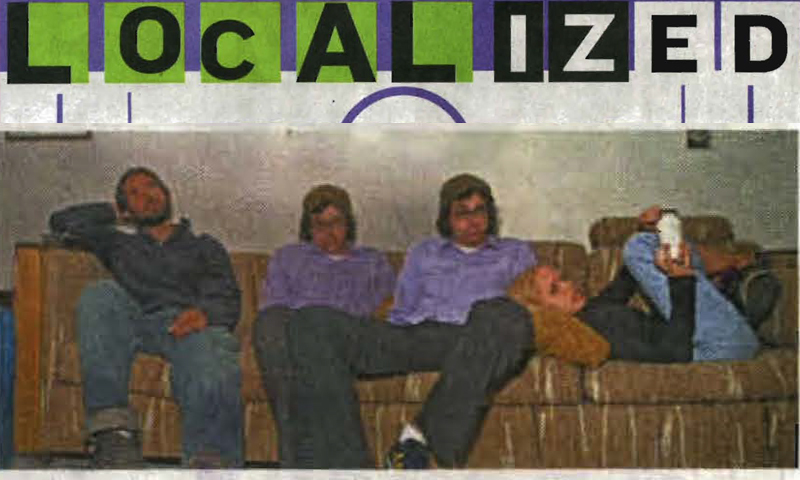 Localized is a monthly showcase of local bands. This 8th of October, we bring you (although you clearly don’t deserve it) On Vibrato and Victrola. This would be a good time to mope over your last ineffectual and failed relationship or to pensively sip a beer and consider the hypothetical events following. As always, the Urban Lounge is a private club for members only. Mike is my roommate. His room is located above mine and I can yell upstairs when I need to find him. Arranging this interview was very simple. I told Mike when we needed to meet while he made himself dinner and he called his two friends. I’m a big fan of events and activities that do not require me to put on shoes, so this worked out well. Tyler and Megan arrived at separate times. It was a rainy and dark day and we didn’t turn on the lights so we all sat in half-light on couches, talking in sleepy voices. For the most part, we discussed parasites. Mike told us about a friend in the biology department at the U who had a series of bumps at the base of his skull whose meaning eluded all the doctors he visited. The bumps got larger and finally a professor was asked for her advice. She held a heat source close to his skin and large white larvae erupted from each bump. Russ, the photographer, shared some equally repulsive stories about chiggers and a recent trip to one of the Dakotas. The best way to deal with a chigger is to put a smear of Vaseline over the area to suffocate them. Mike classifies Victrola’s life cycle as having two stages. Its primary stage, or its original host, is the one wherein Victrola resides only in Salt Lake. The second stage of its life cycle is rapidly approaching, they hope, and that will be when they move on to the larger host body and begin touring. “We all really enjoy performing and I hope that that is apparent when we’re onstage. We’ve gotten some good response when we’ve played.” Mike says. “Especially the last time. There was one part in one of the songs where I take a break and I overestimated the length of that break and so I threw my hands in the air and some people responded to me doing something stupid,” Tyler added. “I think that this band is like where we all invest a lot of our energy,” says one. The three used to be in a variety of other bands, and now only Mike is in Hello Amsterdam. Victrola satisfies the musical aspiration right now for its three band members. Indie is not a word that they are satisfied with to describe their music, although it can be applied pretty aptly. Indie with a little folksiness. “In the first larval stage of the parasite, indie worked, but now the parasite has started to eat away at that word and there’s only ‘die’ left,” Tyler continues with the parasitic theme.